Government action on the nation’s deficit in the coming months may result in future tax increases, adding to the challenge of long-term planning. As a result, it makes sense for clients to focus on tax strategies now, and take advantage of the clarity in tax law that exists through 2012. It is not the first time the country has faced this situation. 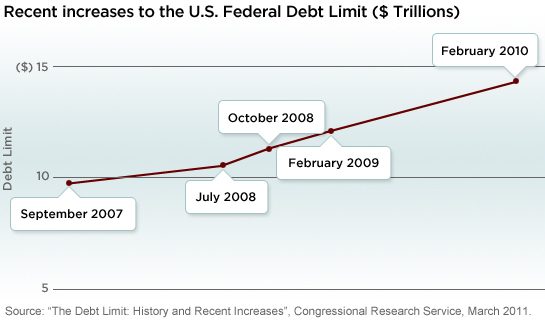 The debt ceiling has been raised through legislative action several times in the past few years. But today’s debate has intensified, as members of Congress disagree on whether the action should be coupled with spending cuts, and how deep those cuts should be. Failing to raise the debt ceiling has implications for the federal government’s ability to manage its finances and service existing debt obligations. This issue is also part of the broader debate on dealing with the federal budget deficit. Though the resolution of the debt crisis is uncertain, it will likely require a cutback in government spending, entitlement program reform, and the need to grow additional revenue through taxation. Given the variables, long-term planning can be complicated. But for the near term, the tax rates are set. Now is a good time to review tax planning strategies with clients as the ordinary income, qualified dividend, and long-term capital gain taxes remain at historically low levels.